The Anatomy of Hair and why more than one treatment is necessary. Hairaway Canada provides some answers. There are one or two important things you should know on the microscopic level. Hair grows rather like the dead corneal layer of the skin: cells flatten and keratinise which as defined by the dictionary means to undergo a type of change. Nails grow in a similar way. A germinal layer in the proliferative zone of the bulb continuously produces cells. Melanin is produced by melanocytes in the bulb, the cells keratinise ( undergo a change), include the melanin and form the shaft of the hair. The hair goes through a growth phase called ANAGEN and whilst in this phase continues to grow longer, then stops growing and starts to shrink away from the proliferative area of the bulb. This is called CATAGEN. The hair then enters the final phase during which it falls out: this is TELOGEN. It is only when the hair is in anagen that there is good physical proximity between the hair and its germinal cells. These germinal cells have to be destroyed for the follicle to cease producing hair. For these reasons, hair must be in the active growth phase or anagen for the medical laser treatment offered by Hairaway Canada at its clinic in Unionville, Markham to be successful. Only a proportion of hairs are in the stage of growth at any one time. For this reason more than one treatment is required for a good percentage of the hairs to be permanently removed. In hair removal applications only four medical laser types are used with any success. The Ruby laser, working at a wavelength of about 700nm ( nanometers), is a red light and was the first and is the still very effective. It has the disadvantage of being a very inefficient laser requiring a huge amount of input power for a useful output; it is also not good for darker skin types. The Alexandrite laser operates at about 750nm which is just in the infrared spectrum, it can be effective but both these machines usually suffer from insufficient power for the fairer skin types. The YAG laser operates at about 1000nm and if you look on the following graph you will see that this is in a part of the spectrum where water starts to absorb light and where melanin absorbs it poorly. This is all bad. The melanin does not get as hot as it should and other cells in the epidermis which we want to protect from heat get too hot because they contains over 70% water. These are not widely recommend laser types for hair removal. Intense Pulsed Light systems, mistakenly and commonly referred to as lasers by a majority of service providers here in Ontario, use a flash lamp as their source of light. This light is of all visible and many invisible wavelengths. These machines find it hard to get enough light at the right wavelength to the hair follicle. The following is an absorption curve graph for the important molecules in the physics of hair removal. Note that the Ruby, alexandrite and diode lasers all have good melanin absorption rates, but poor absorption by both water and the haemoglobin in blood. 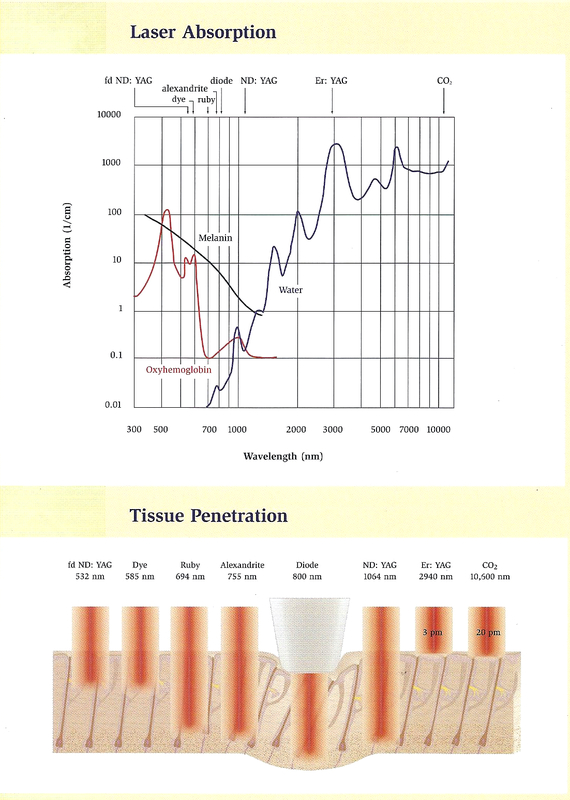 Following the graph is tissue penetration chart showing the depth of penetration of the various types of lasers available in the market today. Note that the Diode laser, as the ones used at Hairaway Canada at their hair removal clinic in Markham has the greatest tissue penetration. There are systems around where the chromophore is applied in the form of a gel; these gels are either black from the carbon content or green using another chromophore. They do not work. Only systems where the melanin in the hair is itself the chromophore work. Yet other systems require that the hair is waxed first. This offends the basic physics - they do not work. The service providers would have you believe that the chromophore penetrates the hair follicle from which the hair has been removed. This would be good, because it would not matter what colour the hair was. Unfortunately no one has worked out how to get a useful amount of the chromophore substance into the follicle. The medical lasers which can actually produce the results desired by those seeking hair removal are those used at Hairaway Canada at its medical laser hair removal clinic in Markham. Factors affecting successful Hair Removal. 1. POWER: First sufficient power must be applied, enough in fact to heat the core temperature of the hair sufficient enough to carbonise the hair producing cast. This can only be achieved by medical lasers for hair removal. Intense Pulsed Lights commonly used at beauty salons and non specialist centres cannot generate the necessary power levels. 2.WAVELENGHT OF LIGHT: At 800nm the light penetrates the skin well to reach deep follicles, better than Alexandrite or Ruby Lasers and far more effective than IPL systems. This is because shorter wavelengths are more easily reflected around by the superficial skin structures than the longer wavelengths of the medical lasers used at Hairaway Canada. 3. COLOR OF HAIR AND SKIN: The hair MUST be pigmented ( ie have colour, like be black, dark brown, brown and in some instances light brown as well.) The less pigment, the more power will be required but high powers can only be applied to very fair skin. Very fair hairs are untreatable for permanent hair removal. From the Fitzpatrick Classification of Skin types chart, we are able to provide effective treatment to Types 1 through Type 5. Type 6, i.e. those with black skin are not treatable. 4. DIAMETER OF HAIR: Hair has a low specific heat, this means that a relatively small power input will result in high hair shaft temperatures but it also means that its ability to store heat is small. The thicker the hair the greater storage capacity from which to spread the heat to neighbouring structures. This means that very fine hair needs to be heated to higher temperature than coarse hair. 5. GROWTH CYCLES: Please refer to our previous blog on growth cycles. Hair which spends a high percentage of its time in Anagen always treats better because hair in Telogen does not treat. 6. DEPTH OF THE BULB: The bulb area of the follicle can be several mm deep. The medical laser used at Hairaway Canada, because of its long wavelength is not reflected to the same extent by the various dermal and epidermal structures, thus allowing more photons to impact with deeper hairs which are also usually coarser hairs. 7. PULSE WIDTH: Each spot delivered with the medical laser used at Hairaway Canada consists of a pulse which can be varied so that all its energy can be delivered in a shorter time or alternatively spreads it out so that the energy is never so high but lasts longer. Both have the same heating ability but the hair does not become so hot in the second and the heat spreads to the surrounding structures for longer. 8. THERMAL RELAXATION TIME: The advanced medical lasers we use at Hairaway have two settings. Where the time the energy is applied is automatically set and the other where the time is fixed. 9. BONE EFFECTS: The epithelium is subjected to both the primary light generated and a secondary pulse which is reflected on the bone. Our experience, having successfully performed over 60,000 procedures enables to ensure that when treating boney prominences, our treatment parameters are adjusted accordingly to ensure absolute best possible outcomes. 10. SUNTANS: We do not offer treatment to clients whom have sun tans. First they cause the skin to be darker, so putting it into a higher skin category than necessary but more importantly colour from tanning poses a larger problem which means we would be obliged to reduce the power levels resulting in a poor treatment with no out come. 11. GENETIC FACTORS: If it were a simple matter on analysing the skin colour and then applying the appropriate energy level, we could have colorimeter do the job and do the job as the machine advises. This is what commonly happens at Beauty Salons and non specialists centres. They rely on the machine to advise them! Unfortunately things are not easy and requires service providers with a deep understanding of all the factors that can affect the outcome of a treatment. Thankfully, Hairaway Canada has the necessary experience and skill sets to assess each client carefully and proceed accordingly. Selective Photothermolysis is the name given to a process in which the hair is selectively heated to a much higher temperature than the skin through the action of light. Melanin, the chromophore which colours the hair and which is also present in the inner and outer sheath, absorbs light from the laser, becomes hot and passes this heat on to the hair itself. 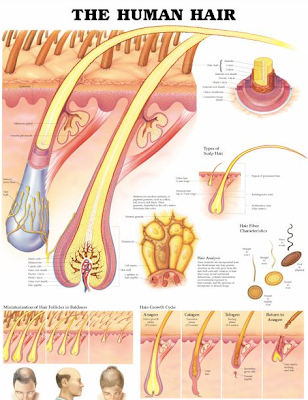 The proliferative region of the hair follicle responsible for the actively growing hair is then heated because of its proximity to the hair shaft. If these cells are heated to a temperature greater than 65 degrees, the protein making up the cells will coagulate and these cells will die. The death of these actively dividing cells of the hair bulb section of the hair follicle results in an inactive follicle no longer capable of producing hair. Death of a proportion of the cells only, results in the miniaturisation of the follicle with the result that the hair will grow finer on return. Death of some of the melanocytes, the cells that five colour to the hair, will result in a fairer hair returning. So from this you will see that the degree to which the hair is heated is absolutely critical to the achieving a permanent result of the treatment. Too low a fluence ( the energy setting on the device) will result in insufficient heat to kill the cells responsible for hair growth. This is most often the outcome of the treatment with devices such as pulsed light systems used at beauty salons and non specialist centres. Too much energy and the skin pigment ( also melanin) will absorb sufficient light to heat the germinal cells of the epidermis resulting in an aggressive response. We have successfully performed over 60,000 procedures and are eminently qualified to produce results which are permanent at our hair removal clinic in Markham. Our medical lasers are the most advanced systems in the market for hair removal and you can rest assured that they generate the appropriate amount of energy to generate the heat required to cause the coagulation of the cells. Dealing with Hyperventilation / Panic attacks. A few words of advice from Hairaway Canada. Short rapid breathing can be brought on by anxiety amongst other things. The symptons can usually last about 15 minutes to 30 minutes and can seem like hours to anyone having them. Though very frightening to the person, hyperventilation is not usually dangerous. Breathing into a paper bag increases the amount of carbon dioxide in the blood and relieves the symptons. The following steps should be followed and in all if not most instances should provide a remedy within a short span of time. Your clients will appreciate the professionalism. Make direct eye contact with the person and avoid getting caught up in the panic. Speak slowly and clearly. Allow the person some space. Minimise embarrassment and avoid an audience. Get them to sit down and sit with them at eye level. Ask them to loosely cover their nose and mouth with a small paper bag. Ask them to breathe slowly into the bag and re-breathe the air in the bag about ten times. Set the bag aside and ask them to breath normally for a couple of minutes. Repeat last two steps until the symptons lessen or go away. Encourage them to breath slowly asking them to inhale taking a long, slow breath ( breath with them). Exhale slowly ( pucker your lips like you are going to kiss). Tell them to relax in a calm voice just before they reach the end of exhalation. Continue encouraging them to breath normally. Hairaway Canada considers medical laser hair removal to be a clinical procedure and as such employs medical protocols in every aspect of the provision of its services. From the initial consultation to post procedure. Diabetes and Medical Laser Hair Removal. Hairaway Canada always assesses the clinical suitability of all its prospects at the time of initial consultation. Diabetes is not an uncommon medical condition and therefore as professional medical laser hair removal specialists, it important to know whether our prospects have diabetes so we are able to administer to and provide them with effective and safe treatment. People suffering from diabetes need to control their blood sugar levels by balancing the amount of sugar in their diet with insulin injections. Diabetics undergoing long treatments, such as legs, may go past a necessary meal time without realising it. If a diabetic client starts to feel or behave strange, we provide some glucose powder mixed with water or Glygocen syrup. Diabetics can become irrational when very hypoglycaemic. The problem may be that the blood sugar is high, diabetics always know the difference, but when there is doubt we always provide glucose. Making blood sugar higher is much less dangerous than not treating a very low blood sugar. Diabetics are more sensitive to the discomfort associated with medical laser hair removal due to sensitive nerves and tissues. They also respond more vigorously and if treated by inexperienced hands or inferior technology more commonly used at beauty salons and non specialist centres or clinics can blister due to damage of their nerve endings. Diabetics are also more prone to infections. Hairaway Canada assesses the clinical suitability of all its prospects at the initial consultation at its medical laser hair removal clinic in Unionville, Markham and if it is determined that the prospect is unsuited for medical laser hair removal and we feel we would be unable to provide a safe and effective treatment we will not offer treatment. Preparing for Medical Laser Hair Removal. Some words of advice from Hairaway Canada. Medical laser hair removal is definitely more than just simply zapping away unwanted hair. It is a medical procedure that requires training and a lot of experience to perform. Before getting hair removal, we recommend that prospects should thoroughly check the credentials of the facility and the personnel performing the procedure. Unfortunately in Ontario, hair removal, is an unregulated industry and anyone, literally, anyone can get their hands on any type of light and heat generating devices, some as weak as some pulsed light systems and perform the procedure; at times with serious consequences for the unsuspecting prospect. Fortunately, barriers to entry for service providers with medical lasers are quiet high. The costs of purchasing a top of the line medical laser, like those used at Hairaway Canada are in excess of $200,000. Ensure that facility operates and functions like a medical clinic. Go and have a look. See if they are clean. That their consultations and documentation are all medical in nature. That the devices they are using are indeed medical lasers and not just the run of the mill pulsed light systems commonly used at beauty salons, spas and non specialist clinics and that the operators have been medically trained and have a minimum of 10 years experience. Make sure they prove to you that they know what they are talking about and know the procedure and have thoroughly explained everything to you. Do not submit yourself to the hands of an unskilled operator. You are liable to suffer the consequences of this. If you are planning on undergoing laser hair removal, you should limit plucking and waxing for six weeks before treatment. That's because the laser targets the hairs' roots, which are temporarily removed by waxing or plucking. Believe it or not that shaving is ok! You must, and this is a must, avoid sun exposure for six weeks before and after treatment. Sun exposure makes laser hair removal less effective and makes complications after treatment more likely. We are often asked whether children or young teenagers are candidates for medical laser hair removal and feel that this would be a pertinent topic for our latest blog. Some children and most younger teenagers experience an onset of hair growth on anatomical areas like their face, arms, legs and even backs and this can at pose problems for some of them. These could be social ones, like being teased or being called names or even something that we as adults may consider not worthy of mention, like being told "you have hair like my elder brother or I think you need to start shaving those legs" can create untold distress for the young mind. On the other side there are the physical issues, for example like ingrown hair on the crease line of the bikini of the younger teenaged girls or the nicks and cuts from shaving the face or the discomfort associated with waxing. The parents of these children leave no stone unturned and seek to provide assurance of a remedy for these children and also work with the children, until a more permanent solution is found by them, to provide interim solution like clipping! Thankfully a medical solution exists at Hairaway Canada. For medical laser hair removal to be successful, a few things must be in place. First and most obviously, a presence of dark hair against an untanned skin and a willing and cooperative candidate. We always recommend that treatment be considered for young teenaged girls after their first menses and for boys until after the end of the their 13th birthday, giving time for the hormones to settle down. Consent of both parents for treatments is an absolute must and the presence of at least one of them during the treatment. But most important of all, the desire to have the treatment from and the cooperation of the young teenager. As always, we will examine the prospect to ensure clinical and lifestyle suitability conduct a thorough and detailed consultation with the prospect in the presence of their parent(s) to ensure they fully understand the process and are at ease. We have been told that we have excellent bed side manners and are very skilled at creating an environment where the prospect feels at ease both with the procedure, the facility and with us. Rest assured that if we have any inclination that the child is unsuited or that we will not be able to provide a measure of remedy and success we will not offer treatment. Pregnancy and Medical Laser Hair Removal at Hairaway Canada. A few words. There have been a number of occasions since our inception that we have been asked whether pregnant women can have medical laser hair removal and thought it would be an appropriate subject for our blog. The medical lasers used at Hairaway Canada work in the infra-red spectrum of light. There is no ultra violet component in the light and therefore no sinister complications can result. There is absolutely no possibility of any issues with the unborn foetus from the light or the heat which is generated by the laser. However, we always advise that medical Laser Hair Removal should only be carried out, latest, up to the end of the first trimester if it cannot be avoided. The reason is that the procedure in certain anatomical areas, like the axilla (underarms) can sometimes result in discomfort for the client and as a result of that discomfort and concomitant stress to the client the foetus might get stressed as well. We simply do not wish to cause the unborn child any undue stress and therefore encourage our pregnant clients, whom we feel may encounter discomfort, to postpone their treatments until after they have delivered. Ingrown Hairs. What are the causes and can Hairaway Canada provide a remedy with its hair removal service? Following the most recent blog on facial hair removal, the writer is now faced with several spots on the face where the hair has ingrown, causing a lot of irritation and some transient un sightly marks. 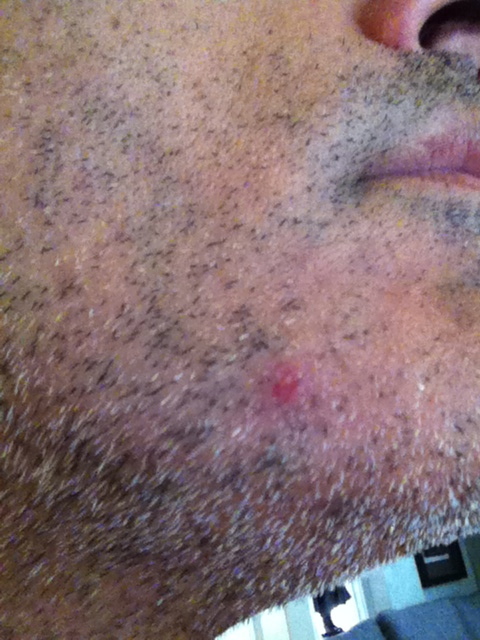 A photo is attached to show one such spot. Apologies if undue stress is caused. :) You can see that I have not shaved for a couple of days to try and get the skin to heal itself, which from past experience is the outcome. It can take up words of three to five days for the ingrown hairs marks to disappear and for another shave. Thinking that ingrown hairs are a problem that is faced by a plethora of people, What is an ingrown hair? According to Medic On Line, an Ingrown hair is a very common skin condition in adults and they tend to be more common in areas with coarse hairs, like the bikini area in women, and beard and neck in men. Individuals with thicker, coarser hairs, such as African Americans, tend to have the highest rate of problems with ingrown hairs, particularly of the beard area. This is called Pseudofolliculitis barbae. Rarely, an ingrown hair may also appear in other skin parts, such as the eyelid. Generally, an ingrown hair is medically harmless, yet it may become cosmetically disfiguring and lead to scarring, skin discoloration (referred to as post-inflammatory hyperpigmentation), skin infection and rarely a scar. The photo of the writer of this blog shows the outcome. An ingrown hair happens when the sharp tip of the hair curls back or grows sideways into the skin of the hair follicle. It is a benign condition, which usually appears as a small tan or sometimes pink bump under the skin. Often, a small pinpoint (often dark) part of the underlying hair may be seen under the skin bump. In more extensive cases, multiple small red or pink little bumps ( see photo above) around hair follicles may be seen on any skin area that has been frequently shaved, such as the face, neck, armpits, legs, and pubic region. Ingrown hairs are a benign skin disorder commonly seen in teenagers and adults. Ingrown hairs more frequently occur in adult men with darker skin or African-American skin. Ingrown hairs commonly occur on shaved areas, such as the face, neck, armpit, legs, and pubic region. Ingrown hairs look like scattered, pinpoint tan or red bumps. Ingrown hairs can be cosmetically disfiguring. Ingrown hairs are often caused by shaving too closely. Ingrown hairs may resolve on their own without treatment. Infection of skin can occur. 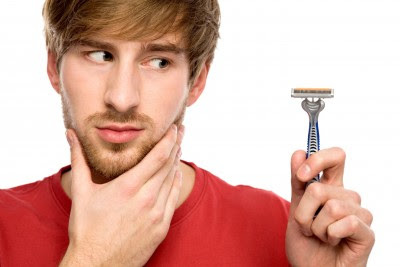 Avoid close shaves to prevent ingrown hair. The medical laser hair removal service provided by Hairaway Canada at its hair removal clinic in Markham is the best option to prevent ingrown hairs. One treatment can typically provide immediate remedy. As my face has been exposed to the sun over the course of the past month, I am not a candidate for medical laser hair removal and therefore unable to provide you with a before and after photo following a treatment. Thanks for Medic On Line for providing the information on ingrown hairs. Facial Hair Removal for Men at Hairaway Canada. Is it for you? First thing in the morning when they wake up and are brushing their teeth, perhaps again at 5 o'clock in the afternoon, when they have nicked their face with the blade or when the love of their lives screams out in pain that they are like a porcupine are the instances that men think about the prospects of 'never' having to shaving again. Just the thought of applying the shaving cream, gel or soap to their face and gliding that blade over their skin is enough to make some men shout out loud "Why me?" or "Why could I not be living or working in a country or region where having a beard is the norm." or "Why is her skin so sensitive that she has to screech in pain every time I come to kiss her in the evenings?" or "Why can't Gillette manufacture a blade that will not, despite my efforts, nick me?" And it is precisely at these times that men wonder what it would be like never to have to shave again. Fortunately the medical laser hair removal service offered at Hairaway Canada is able to provide some degree of resolution to the needs of the men whom would like to deal less with the 'chore' of the daily shave. On the occasions that we have deemed it possible to provide a treatment for the removal of the hair from the facial region ( beard or moustache), the results have been truly magical. The immediate response of the skin to the procedure is vigorous though. Depending on the thickness of the hair, the perifollicular oedema and erythema, can be quiet substantial and can last for anywhere from 48hrs to 72hrs. So it is always prudent to take a few days leave from work or public activity and wait for the response to subside. This is an image of perifollicular oedema and erythema which will occur on the treated area and if the face is being treated, then this will occur on the entire anatomical region. We do not always recommend a full facial hair removal treatment and suggest that as a first step the neck line is treated so that the man does not have to shave the hair from the neck line to the top of the chest region, which does occur in some men. The results of the hair removal treatment with the use of medical lasers at Hairaway Canada are dramatic and noticeable even after the first visit and mean that the client does not have deal with the prospect of razor burn, nicks or ingrown hair or an irritated neck caused as a result of his hair rubbing against his shirt collar. Face it! Men deserve to reduce their dollar spend on blades and not having to deal with shaving as frequently as before. What makes us happy here at Hairaway Canada. Year after year over the past thirteen years we have been providing what we consider to the best professional service in medical laser hair removal and after care available. When we set up our hair removal clinic here in Markham, we knew that we would face extraordinary challenges in setting up here but we have a deep seated belief that we are very good at what we do and therefore knew that in time, there would be a recognition that Hairaway Canada is the name synonymus with, the most experienced and professional medical laser hair removal available in Markham and Toronto. We set very high standards for ourselves and know that our clients are deserving of the very best professional care at all times. It is therefore heartening for us when we receive words of appreciation and acknowledgement from our clients. What is experience and why does it matter when it comes to hair removal by Hairaway Canada at its hair removal clinic in Markham? Experience is defined by the dictionary as knowledge of or skill of some thing or some event gained through involvement in or exposure to that thing or event. Hairaway Canada and its owner operators have been directly involved in medical laser hair removal since the inception of Hairaway Singapore in the year 2000. They have been exposed to all aspects of hair removal with the use of high powered medical lasers on all skin types with particular emphasis on the Asian skin typo with its preponderance of melanin. Hair removal with the use of medical lasers is possible on most skin types but it is crucially important that service providers with experience, like Hairaway Canada, with over 60,000 procedures under their belt, assess the clinical suitability of the prospect and provide clear and unambiguous advice on the outcomes. There are several contra-indications to hair removal with the use of high powered medical lasers. Some pertain to existing medical conditions. For example if the prospect has diabetes or asthma. Or if they are taking medications that cause photosensitivity. Only experience can provide the assurance to the prospect that these and other important matters are considered when choosing an experienced, professional, reliable and honest service provider whom knows what they are doing. Hair removal with the use of medical lasers, like those at Hairaway Canada, is considered in some quarters by some a surgical skill set and one simply does not obtain these skill sets by having little or no exposure to medical lasers, dermatology and medicine. You are in excellent hands at Hairaway Canada. Facial Hair in Women. A big problem for some but with Hairaway Canada there is a solution. Excessive facial hair in women is not just a cosmetic problem. It is also perhaps a sign of an underlying medical condition that in most circumstances can be treated effectively with the use of the medical lasers at our clinic. Up to 15% of women have excess facial hair and in many case a hormone disorder is the most likely cause. Polycystic ovary syndrome (PCOS) is the cause of excess facial or body hair in anywhere from 70%-80% of the cases. According to the Womans' Health Web Site, The cause of PCOS is unknown. But most experts think that several factors, including genetics, could play a role Women with PCOS are more likely to have a mother or sister with PCOS. Hirsutism, is very distressing and can be particularly upsetting for young women. Estimates of how many women are affected are likely to be underestimated because women can be reluctant to seek help. In addition to PCOS, which is a major cause of fertility problems, rarer causes of excessive hairiness include certain tumours and thyroid dysfunction, as well as the use of certain drugs. Dr Rebecca Swingler, from St. Michaels Hospital in Bristol, says that "Often women have had to cope with their excessive hair growth for many years before seeking professional help." Mild cases of hirsutism can be treated cosmetically with the use of medical lasers but in moderate to severe cases, hormone therapy, such as the oral contraceptive pill and other treatments are available. The professional and experienced owner operators at Hairaway Canada will be able to provide the best advice for those seeking a long term solution. Red, Blonde, Gray and White? Hairaway Canada provides the answer. Semiconductor medical lasers are considered the most efficient sources of light available to achieve the cosmetic outcomes desired by those seeking to remove hair from various anatomical regions of the body. According to the Wellman Labs of Photomedicine at Harvard Medical school, Medical lasers operate on the principles of selective photothermoloysis which "combine selective absorption of light energy by the MELANIN in hair follicles with suitable energy levels and providing cooling to the surrounding epidermal and dermal regions. " The key and operative word and structure in the above sentence is Melanin. Melanin is the pigment which provides the hair its color. It is also present in the eyes and hence the mandatory use of protective eyewear during the procedure and in a vast swath of humanity is what gives them their color; ranging from the peoples of the Mediterranean, to the Middle East, South America and Asia. Advanced medical laser systems are designed to remove unwanted hair through this process of selective photothermolysis. This involves the selective absorption of a very strong and intense pulse of light at a continuous wavelenght by the hair follicles but NOT by the surrounding tissue. In medical laser hair removal the MOST important and dominant absorber of the energy generated by this strong and intense pulse of light a continuous wavelength is melanin. In Red, Blonde, Gray and White colored hair, there is INSUFFICIENT melanin in the "hair follicle" and therefore the energy being generated by the medical laser cannot be effectively absorbed by the cell to cause the protein in the cell to become denatured and cause the elimination necessary to achieve the cosmetic outcomes desired. Black and Dark Brown hair are ideal hair colors for medical laser hair removal. Red, Blonde and Gray and White as colored hairs simply do not have enough or any melanin in them and will not respond to the treatments provided. Should you have your pubic hair removed completely from your 'nether' regions at Hairaway Canada? To be or not to be 'au naturel' is the question and it is the hoped that the following few words will provide some clarity for those, women and even men considering having the hair from their pubic regions cleared. There are several reasons people chose to have their pubic hair removed. Cosmetics is by far the number one reason and the concomitant perceived or otherwise notion of an increase in sexuality or cleanliness. "Ever since I had my brazilian clearance from my pubic region, my husband cannot keep his hands of me." Or " The moment he saw what I had done, he devoured me." These are just a couple of the comments we have heard from some of our clients whom have decided to have the hair from their bikini region cleared completely. We sometimes also get " ever since my girl friend had her brazilian, she feels a lot cooler and cleaner." The medical lasers used at Hairaway Canada are some of the most powerful lasers available in the market today and because of the power and ability to eliminate hair producing cells, one or even two treatments would provide the thinning out come required. However, if a complete clearance like My Bare Lady depicted above is desired, then depending on the prevalence of pigment in the vaginal area, four to sometimes six or eight treatments may be necessary to achieve your goals. Men also choose to have the hair removed from the pubic region and like women, it most often has to do either with the perceived sexual enhancement from a much more visible phallus or simply as a means of grooming; either to provide some cooling or simply achieving a certain look which their partners and they themselves like. As the results of the procedure at Hairaway Canada are permanent we always encourage our clients to carefully consider the option of a complete clearance. Because what is deemed to be fashionable today may not necessarily be so tomorrow. That being the case, we have absolutely no means of regrowing the hair in the region other than transplanting it once it has been treated by the medical lasers. MEDICAL LASER HAIR REMOVAL AT HAIRAWAY CANADA MARKHAM FOR MEN. Do you wake up in the mornings and have a look in the mirror and cannot help but notice your chest and abdomen, your shoulders, your back or even your ears and wonder if this whole hair growth thing is just beyond control? Having carried out over 60,000 procedures, we consider ourselves experts in medical laser hair removal and discuss this solution available for men. Hair removal was, and the operative word here is, was, a female thing. This did not even factor into the equation for men. If they had hair, they and at most times, the women or even men in their lives, much to their chagrin, just put up with it. Unless of course they were competitive athletes like swimmers, body builders, dancers or even cyclists - not like the disgraced Mr Armstrong though. But that is a subject for another day and another blog. These days, the hair removal regime is not the sole purview of women as men now aspire to having same smooth hair less skin. So depending on the area, most men would like to see their hair gone for good or in some areas, like their chest and abdomen or even their legs the hair merely thinned out. Men also are opting to have hair removal on the hair which grows between their eyebrows, you know the area we mean, the one they or even their partners are having to pluck, with the use of medical lasers at Hairaway Canada. This area in medical term is called the Glabella. Laser is an acronym for Light Amplification with the simulated emission of radiation. But before you get all hot and bothered about the last word in this sentence, you should be happy to note that medical lasers amplify light and create heat energy using infra red light. This means you have absolutely no risk of sinister complications. The UV component has been removed from lasers so in experienced hands like Hairaway Canada, they are completely safe and very effective. If thinning of hair is all you seek, then one or even two treatments are considered more than sufficient. However, if you wish to obtain a clearance then six to eight treatments spanned over a course of eight to twelve months would get you to your goal. Treatments can roughly take anywhere from 30-45 minutes. A question which is often asked and rightfully so. Understanding the hair growth cycle and the structure of hair follicles will enable you to understand when and how hairs are destroyed and why it takes more than one more treatment to obtain a near complete clearance of hair from the treated area. All hairs in any given body area are not present at the same time. There is always a percentage (approximately 10%) of empty hair follicles on a body area that has not been recently waxed or pulled out by the root. When hair is waxed out it is mostly removed including the roots. (Some snap off just under skin level and grow like shaving regrowth) After about 10 to 14 days the first signs of regrowth appear. This looks like fine tips of new hairs and it is certain they are ANAGEN hairs. Our earlier blog describes the hair growth phases in detail. 2-4 weeks after a wax is ideal and appropriate for medical laser hair removal at Hairaway Canada's hair removal clinic in Markham. It is important for you to know that HAIR FOLLICLES CAN ONLY BE DESTROYED WHILST IN ANAGEN PHASE. Between 10% to 30% of a full regrowth of hair (i.e: 3 to 4 months of undisturbed growth) are in the anagen phase. The remaining percentage will be in catagen or telegen phase and do not have the root structure that can be destroyed / eliminated. If you study a diagram of an an anagen hair you will notice the root has a bulbous structure situated just above the dermis. There is a small capillary structure that connects the bulb to the dermis for blood supply to feed the hair. This is called the Dermal Papilla. Within the area of the bulb and the dermal papilla are the germ cells that produce the new hair. It is this very small but crucial area that Hairaway Canada aims to destroy with treatment using heat generated by the most advanced medical grade lasers at its hair removal clinic in Markham. By destroying the dermal papilla and germ cells we are permanently destroying the follicle so its does not produce another hair. Hair follicles in the catagen or telegen phase will not destroyed, although you will still be creating heat build up in the skin by heating the hair. This is why it is favorable to treat relatively new regrowth so you are treating most anagen hairs. This is why the terms of the guarantee Hairaway Canada provides to all its clients states that the client must return for treatment within 4 weeks of first seeing regrowth. In some circumstances it can be argued that it would be best to return for treatment within 2 or 3 weeks of seeing regrowth. This depends on the length to which the hair will grow. So from the above you can see that at any given time anywhere from 10% to 30% of the hairs are in the crucial anagen phase and the results of the destruction of the hair producing follicles is restricted to these numbers. So if a reduction is all you seek, and in some cases, some clients only desire a reduction, then one treatment would be more than sufficient. However, if you are seeking to eliminate the hair producing follicles, then multiple treatments are necessary and this can range any where from 4 treatments up to 8 and some times more on certain anatomical regions. Physiological responses to treatment vary from individual to individual so there is no set number for any person. Scalp hair can have an anagen stage of 6 years, so if Hairaway Canada were ever to offer hair removal at its hair removal clinic in Markham with the use of its advanced medical lasers, there would be plenty of time to destroy the live root after seeing it emerge from the skin. A man's beard would also have plenty of anagen time as it has the potential to grow quiet long if it is not shaved. Most body hair has an anagen phase of 2 to 4 weeks depending on the person and the body area. Hair's on a lady's upper lip would have less time in anagen phase because the hair is short. This mostly depends on how coarse the hair is. Coarse hair has deeper root, larger dermal papilla, therefore a greater blood supply, so it will grow much faster than fine hair. So we have the length of the hair and the coarseness of the hair to consider when estimating the timing of the persons next treatment. With women who have "male pattern' hair growth due to hormone influence you may see faster regrowth even with hairs that not especially coarse. To produce permanent results with its medical grade lasers at is hair removal clinic in Markham, the anagen follicle needs to be heated to a specific temperature ( around 70c) by Hairaway Canada. If sufficient heat is not produced the follicle will be partially destroyed and return as finer hair, or its growth cycle retarded so it takes much longer than usual to return. This can mislead people who have treatments done with devices that are not medical grade lasers, such as IPLs, commonly and mistakenly referred to as lasers, used at beauty salons and non-specialist clinics. They initially believe the hair has been permanently destroyed only to find that 3 to 6 months later a uniform regrowth has appeared. The treatments we offer at Hairaway Canada aim to prevent simply retarding the hair by treating during the correct stage of the hair cycle with the requisite sufficient amount of energy. Call Hairaway Canada on 905 479 8880 for your hair removal needs. You have nothing to lose but your unwanted hair. A guide from Hairaway Canada for Brides to be. It is just as important to have silky hair free skin for your big day, as it is having silky hair free skin for what comes after - your honeymoon! As a new bride we know that you would not want to waste time at an aestheticians or in the bathroom shaving while your husband lounges by the resort pool or at the beach sipping a cool drink. With the popularity of Hair Removal growing across Markham and Toronto, the trusted leader in hair removal, Hairaway Canada would like to share the ten things every bride should know about medical laser hair removal, before their big day and embarking on their honeymoon. 1. Start NOW. To ensure the best possible results in time for your big day, you should begin your hair removal treatments as soon as he has proposed and you have accepted :) or have booked the date for the big day. 2. You WILL BE hair free for long periods. Your first medical laser hair removal treatment at Hairaway Canada in their hair removal clinic in Markham can in most instances enable you to remain hairless for up to 6 weeks. As your treatments progress hair will be less visible and finer in density and texture and the hair free period can last up to 8 weeks. 3. You MUST stay out of the sun. It is important to avoid the sun before and after medical laser hair removal procedures. Your skin needs to be of a natural skin tone to be treated effectively. If you are unable to avoid direct exposure to the sun then the application of a high SPF sun block will is highly recommended. 4. Blonde, red and gray hairs are NOT SUITABLE for medical laser hair removal. Medical lasers, like the ones used at #Hairaway Canada at its hair removal clinic in Markham work by heating the darker pigment (melanin) found in darker hair. With blonde, red and gray hairs - because of the lighter color as a result of an absence of the darker melanin, the medical device is unable to heat up the pigment in the hair. 5. Shave. We encourage and recommend that you shave the night before your treatment, the closer the shave the better. If you find it necessary to remove your hair between treatments shaving is best. Do not worry about shaving even if it is your face. Under no circumstances though should you wax, pluck or apply depilatory creams. 6. DO RESEARCH because your big days are important! Make sure to choose a reputable and experienced clinic before you decide to undertake medical laser hair removal. Know the difference between Medical lasers and IPLs. Medical Lasers, like the ones used at Hairaway Canada at its hair removal clinic in Markham are sophisticated and highly advanced surgical equipment which require skill and a lot of experience to operate to their maximum potential. and this is a very thorough process enabling us to establish your suitability for the procedure. 8. Adjust your expectations and be prepared to commit. Medical Laser hair removal is not a one off hair removal cure. It will require a commitment on your part and depending on the anatomical area treated multiple treatments. 9. Keep at it. The more consistent you are the greater the results. So work with us and we will get you silky hair free skin for your big day. 10. A bargain is not always best. There is always a catch somewhere. Do not decide based on the cheapest price. You get what you pay for when it comes to results. Hence we do not subscribe to Groupon or Wag Jag deals. Our pricing structure is transparent without any hidden charges. You will receive the best treatment available. Guaranteed. #Hairaway Canada uses the most advanced medical grade class 4 hair removal lasers at its clinic in Markham. We have invested $500,000 to date on these surgical devices and have performed over 60,000 treatments over the past 13 years. We are the name synonymous with experience and results. A name you can trust. Come to Hairaway Canada for your hair removal needs at their hair removal clinic in Markham. You have nothing to loose but your unwanted hair. Call 905 479 8880 or visit www.hairawaycanada.ca for all the details you will need to be sure you have hair less silky skin on your big day and honey moon. We acknowledge that some portions of this blog were imported from a blog created by a laser hair removal clinic in Australia. We thank that laser hair removal clinic for its advice which we are now sharing with our clients for their benefit.